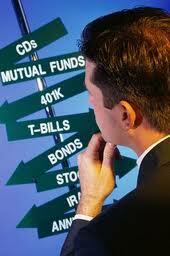 – Choose a no-load mutual fund from an investment firm that you feel comfortable with and has a good history. – Start investing in a tax-deferred account (401k/403b/IRA) as soon as you have earned income. – Invest something every month. Even if it’s the minimum (usually about $50). – Keep your eye on your money, but don’t worry. It sounds crazy that investing can be this simple, but it is. There’s no “magic bullet” that will make you a millionaire and anyone that tells you there is one is more than likely a liar. You have to be willing to set a financial goal and then work toward reaching it by paying yourself first and making sure that you are spending waaaaay less than you make. It’s not rocket science, but most people won’t do it. Not because it’s complicated, but because it’s easier to believe that you can’t be wealthy than it is to work to make it happen. If you’re thinking about investing and you’re a questioning yourself remember this: K.I.S.S. I’m so glad that I had a chance to sit down and talk with Michael Lawson from CU Broadcast. He interviews awesome people involved with credit unions across the country, so I’m honored that he wanted to interview little ol’ me! We talked about why I became a financial educator, why credit unions are awesome, and how my two books “10 Things College Students Need to Know About Money” and “Money Matters: The Get It Done in 1 Minute Workbook” are helping people across the country. Financial education speaker and author Shay Olivarria was quoted this morning in “What to look for in a credit union” on Bankrate.com. Shay was interviewed by Heather Larson about her views on credit unions. As you all know, Shay is a financial educator that loves credit unions! Heather included quotes from Shay on the purpose of credit unions (slide 4), the use of technology by credit unions (slide 5), the importance of building a relationship with the representatives at credit unions and the importance of understanding fees (slide 7). It’s a great article and Shay is honored to be included. 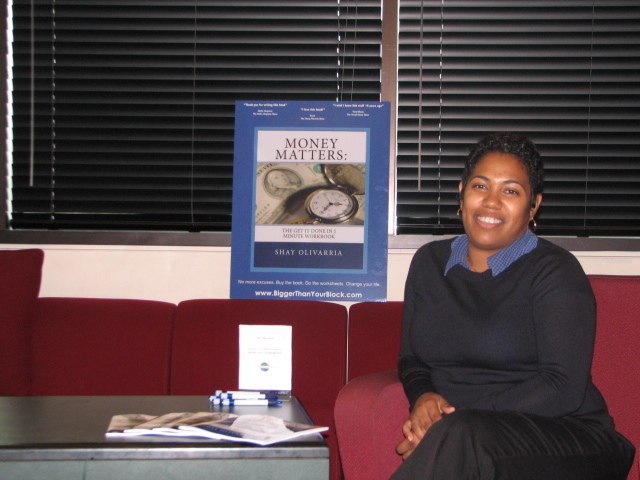 Latina financial education speaker and author Shay Olivarria at book signing in San Diego, CA. This morning as I was reading my way through the blogosphere, I read this post on “The Importance of Money Education for Latina Women“. I was surprised to see that the sites that were noted were about couponing and tips for new moms. Where were the sites for the high school students? The college students? The average professional that wanted a few tips on retirement, opening an account at a credit union, or growing their emergency fund? This prompted me to try and find a Latina financial educator on the web. Guess what? I found nada. When you talk about female financial educators the usual suspects come up. There’s Suze Orman, of course. Some might mention Michelle Singletary from the Washington Post. If pressed, someone might mention Debra Owens. It’s great there are a few women with national recognition, however did you notice that none of these women are Latinas? 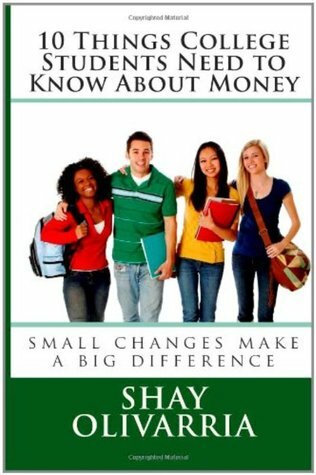 I wonder if there are women out there other than financial education speaker and author Shay Olivarria doing this work? I’m not sure, but I wanted to make sure that when someone did a Google search for “Latina financial educator” at least one name would come up. So, feel free to share this post with others. I’d love to be aware of more Latina speakers and authors that are working to provide financial education to our community. If you know of someone, please share their name and website. Open a Money Market Account. Now. Raise your hand if you save money in your savings account and then transfer it to your checking account so often that you don’t actually end up saving any money. Put your hand down! Your co-workers are looking at you! A money market account is an uber-savings account. You put money in and take money out using a debit card and/or checks just like a savings account. You can only make a specific number of deposits and withdrawals per month. Due to that restriction, you earn a better interest rate than a savings account. You should open a money market account because you have little-to-no willpower. Do you know how I know this? It’s because I have little-to-no will power as well. Life is not about beating yourself up about your shortcomings, but about finding work-arounds for the shortcomings that we all have. I know that if I have thousands, heck, if I have hundreds of dollars lying around in a savings account that links to my ATM card I’m going to be really tempted to buy things that I don’t need. Having a money market account, with restrictions, makes me think a bit harder before I spend my money because I have to consider fees and penalties for taking money out. Money market accounts are offered at credit unions and banks around the country. Before you choose one, check Bankrate.com to make sure that you’re getting a competitive rate. – Don’t sign up for a debit card for your money market account. It’s too tempting. – Keep your money that you’re saving for a short-term or intermediate-term savings goal in a money market account. Read more simple money management tips in Money Matters: The Get It Done in 1 Minute Workbook. After high school, many students are tired of attending school. #1 You’re world view will open up. You’ll become an out-of-the-box thinker that can contribute new and different perspectives to any discussion. Employers and business partners pay well to have people on their team that can contribute “fresh” ideas. If you think like everyone else, you’ll be like everyone else. Dare to have a different perspective and take the road less traveled, literally. #2 You’ll better understand the bottom line. There’s nothing like trying to figure out how many pieces of bread you can buy with your last (choose your currency) to make money management come to life! Everything in life is a business negotiation. The sooner you start learning how to leverage money the faster you can leverage it well both personally and professionally. #3 You learn to make decisions on the fly. Of course it’s good to weigh information, but sometimes we can become overwhelmed by the options and end up doing nothing. When you’re traveling you’ll have to decide which of the restaurants, or food stalls, you choose to eat at. You’ll have to choose your travel options deciding on cost and proximity to where you’re going. You’ll have to make some of these decisions with little-to-know information to go on and live with your decision. Employers like thinkers-and-doers more than thinkers-and-think-againers-and-still-thinkingers. #4 You’ll mature. The fact of the matter is that many students really have no idea what they want to “be” when they “grow up”. Taking a little time off to travel, volunteer, or work provides the student more experience to make wise decisions about their future goals the options available to them to achieve them. 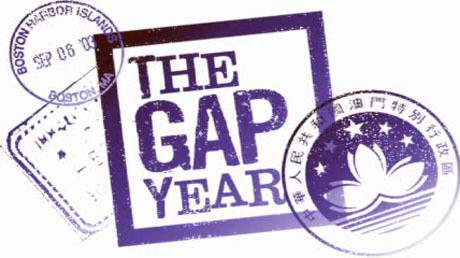 Taking a gap year can help students grow emotionally and provide experiences that can add value as employees.